Pain associated with AOM can be substantial in the first few days of illness and often persists longer in young children.57 Antibiotic therapy of AOM does not provide symptomatic relief in the first 24 hours58–61 and even after 3 to 7 days, there may be persistent pain, fever, or both in 30% of children younger than 2 years.62 In contrast, analgesics do relieve pain associated with AOM within 24 hours63 and should be used whether antibiotic therapy is or is not prescribed; they should be continued as long as needed. The AAP published the policy statement “The Assessment and Management of Acute Pain in Infants, Children, and Adolescents”64 to assist the clinician in addressing pain in the context of illness. The management of pain, especially during the first 24 hours of an episode of AOM, should be addressed regardless of the use of antibiotics. A Cochrane review of topical analgesia for AOM66 searched the Cochrane register of controlled trials, randomized controlled trials, or quasi-randomized controlled trials that compared otic preparations to placebo or that compared 2 otic preparations. . . . The Cochrane group concluded that there is limited evidence that ear drops are effective at 30 minutes and unclear if results from these studies are a result of the natural course of illness, placebo effect of receiving treatment, soothing effect of any liquid in the ear, or the drops themselves. 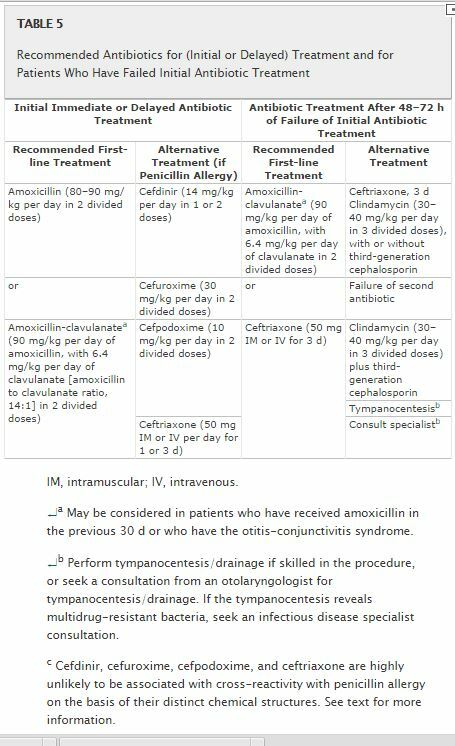 In children with persistent, severe symptoms of AOM and unimproved otologic findings after initial treatment, the clinician may consider changing the antibiotic (Table 5). If the child was initially treated with amoxicillin and failed to improve, amoxicillin-clavulanate should be used. Patients who were given amoxicillin-clavulanate or oral third-generation cephalosporins may receive intramuscular ceftriaxone (50 mg/kg). In the treatment of AOM unresponsive to initial antibiotics, a 3-day course of ceftriaxone has been shown to be better than a 1-day regimen.175 Although trimethoprim-sulfamethoxazole and erythromycin-sulfisoxazole had been useful as therapy for patients with AOM, pneumococcal surveillance studies have indicated that resistance to these 2 combination agents is substantial.130,149,183 Therefore, when patients fail to improve while receiving amoxicillin, neither trimethoprim-sulfamethoxazole184nor erythromycin-sulfisoxazole is appropriate therapy. 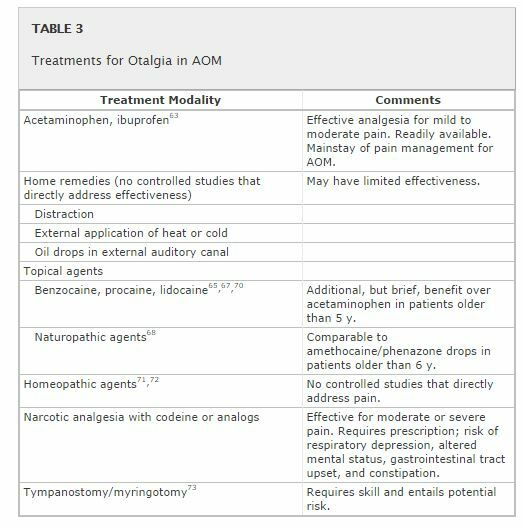 (2) The Diagnosis and Management of Acute Otitis Media, AAP 2013 Guideline [Full Text PDF] [Full Text HTML]. Pediatrics; originally published online February 25, 2013; DOI: 10.1542/peds.2012-3488. (3) ePROM: Enhancing Proficiency in Otitis Media (P.H. Kaleida, D. Ploof – Editors), PedsEd Pediatric Education from the Children’s Hospital of Pittsburgh. This is a series of 8 online courses about Otitis Media. Free registration is required. This entry was posted in Audiology, Ear, Nose, & Throat, Family Medicine, Guidelines, Infectious Diseases, Pediatric Emergency Medicine, Pediatric ENT, Pediatric Guidelines, Pediatrics. Bookmark the permalink.